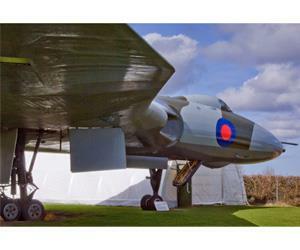 The collection features a massive Vulcan bomber and some of the military and civil aircraft which have flown from Norfolk airfields. Indoor exhibitions recall the local presence of the American 8th Army Air Force. The RAF 100 Group Association collection is presented in a special section devoted to Bomber Command. Other displays show the history of RAF Horsham St Faith, the role of women in aviation and tell of the heroes and pioneers who have made local aviation history. Prices: Adults £4.50, Concessions £4.00, Children (8-16) £2.30, Group Visit available upon request. From the A140 Norwich to Cromer Road follow the brown tourist signs, turning off into Horsham St Faith village, turn right again opposite church. Follow road around left hand bend. Turn right again into Old Norwich Road, the museum is at the end of this road. From Norwich station it is 8 miles to City of Norwich Aviation Museum.